Configure This Drive for Backup uses the new drive for the File History function and is best suited to large-capacity drives, at least 500GB. Configure Storage Settings opens the Settings app so that you can configure the storage settings on your computer. Open Folder to View Files displays the contents of the disk in File Explorer on the desktop. You select this option to copy files to or from the drive you’re attaching. Take No Action dismisses the notification. Notifications appear for the amount of time specified in PC Settings. If the notification disappears before you can select it, you can redisplay it by removing and then reinserting the drive or USB cable. Locate an unused USB port on your computer. 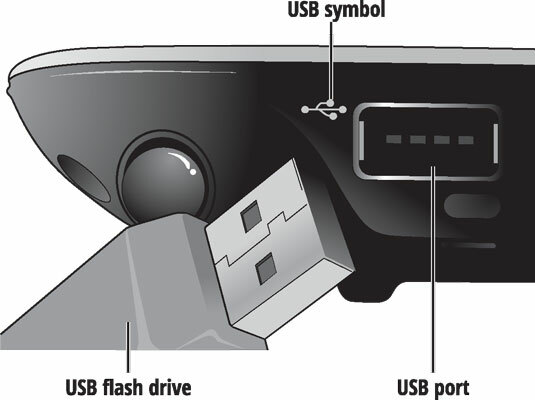 A USB port is a small rectangular slot on the front or back of a desktop computer or along any edge of a laptop or tablet computer. USB ports are often marked with a symbol that looks like a trident, as shown. If a USB port is hard to reach, you can buy an extension cable from any office supply store. You can also buy a hub, which adds ports to your computer. 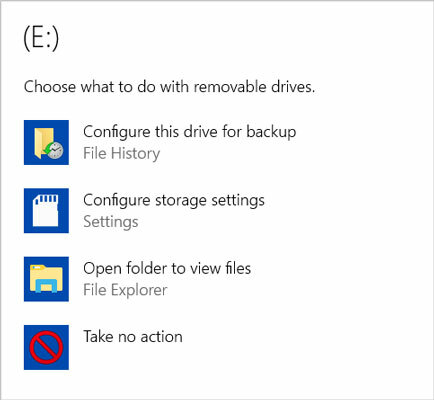 Windows 10 displays a notification to Check to see what happens with removable drives. (You can click the mouse instead of tapping.) If you select the first notification, a list of choices appears, as shown. If you know which action you want to take, you can select that action. Otherwise, select Take No Action or wait until the notification disappears on its own.